The many symbols which represent the American Southwest– howling coyotes, majestic Saguaro cacti, and our Technicolor sunsets– are in direct competition with a ubiquitous desert icon: the Kokopelli dancer. You’ll find the humpbacked flute player pictograph on tee shirts, menus, keychains, and postcards. But did you know that he actually comes from the Native American Hopi religion? The Kokopelli are part of a huge pantheon of deities from the Hopi belief system which represent the spirits, known as the Katsina. (Yes, you read that correctly: the correct pronunciation is Katsina, not Kachina. More on that later). The Hopi believe that everything has a spirit, and the Katsina are a visible form of those spirits. Katsina dancers embody this essence, and the dolls represent the dancers. Over the past sixty years, Katsina dolls have become a popular collectible for some, and a source of income for talented Hopi carvers. Who are the Hopi people? About 1000 C.E. they migrated up from Mesoamerica and settled in the Four Corners region of northeastern Arizona, where they were extremely adept at dryland farming crops such as corn, squash, and beans. The Hopi were one of the first groups encountered by the Spanish, even allowing missions to be built, with representatives of the church living in their vicinity. This ended in 1680 with the Pueblo Revolt, when missions were burned to the ground and Spanish friars killed as native people rose up against the colonizers. Geographic isolation and conservatism has kept the Hopi culture almost intact and unchanged throughout the centuries. Today the Hopi Reservation consists of 1.5 million acres of land located in Arizona, surrounded on all sides by the Navajo Reservation. The population is just over 7,000, which encompasses thirty clans; twelve villages are spread across three mesas. Hopi culture is truly complex. They celebrate a detailed and intricate ceremony cycle which centers on water, as water helps the crops grow and sustains life. From Winter Solstice to the end of July, several ceremonies take place featuring the Katsina. The spirits enter this realm through kivas, underground chambers built by the Hopi. Katsinas take shape to represent plants, animals, food, birds, insects, and even death. The real spirit of Tihu is found within. 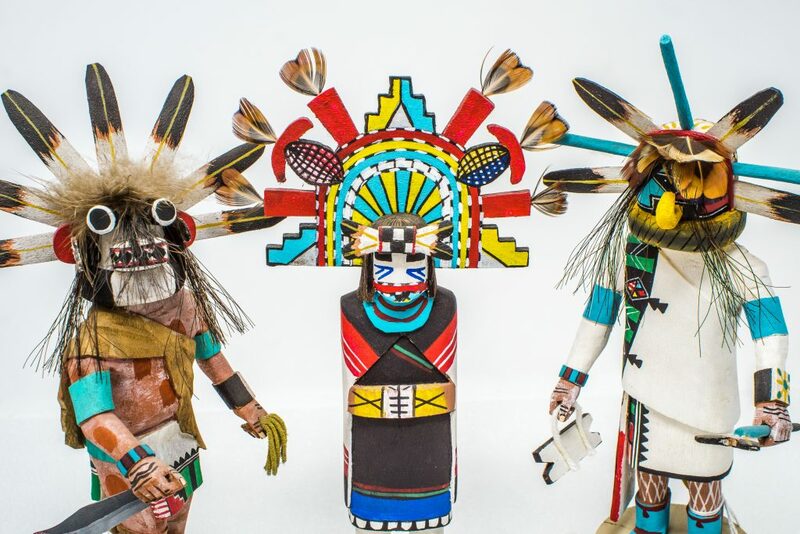 Originally, these dolls were given to children to teach them aspects of Hopi culture. They were not very detailed, and children played with them. The first ones date to the 1700’s; only in the late 20th century did it become traditional to display these dolls on walls or in cabinets to preserve their condition. 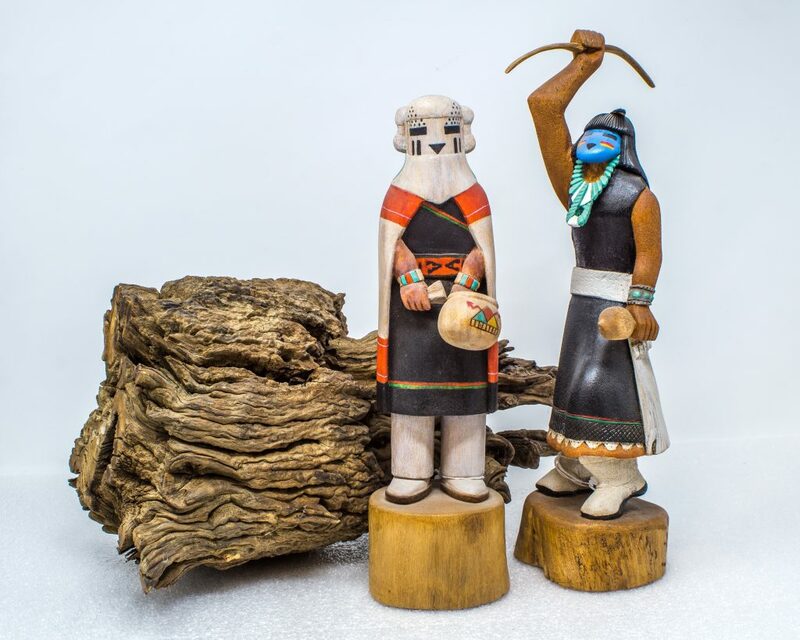 Katsinas are carved from cottonwood root, sanded smooth, and then painted. Each doll is created to represent a different Katsina, of which there are over four hundred versions. Each of the thirty clans may have a different iteration of each Katsina, which generates an even more complex pantheon. It’s difficult to categorize all of the different types of Katsina, but non-Hopi Barton Wright has attempted to do so. Chief Katsinas: Important figures that are associated with specific clans, but they benefit all Hopi. Crow Mother, often considered the mother of the Katsina and Masau’u, who rule the underworld, are chief Katsinas. Ogre Katsinas: These come out in February and March and explain what each child (and sometimes adults) have done wrong. They are offered food and usually have beaked mouths with wild hair, and they usually carrying knives or other weapons. Women Katsinas: There are many female Katsinas, who represent rain and the initiation of children. The women are usually clothed in a black dress with a red, black, and white blanket or shawl over her shoulders. Warrior Maidens are known to defend her village. Clown Katsinas: This category includes Mudheads, Kayaala, and Tsuku. Clowns can be amusing at times, or are used in a teaching moment for the children of the village. Mudheads, who are painted brown with bulbous heads, are also messengers that carry prayers to the rain gods. Mixed Katsinas: This last group encompasses any other types of katsinas, including all the animal katsinas, which are usually advisors or healers. Kokopelli is in this category, and is known not only as a fertility deity, but as one who represents the spirit of music and is a ‘trickster’. Almost all Katsinas will come with accoutrement ranging from ears of corn to deadly weapons, based on their spiritual purpose. Older dolls were painted using ground minerals or plant matter to give them color; today, newer types of paint are used to bring these dolls to life. Katsina dolls are still given to children today, and various ceremonial dances take place with Katsina dancers, some open to the public. 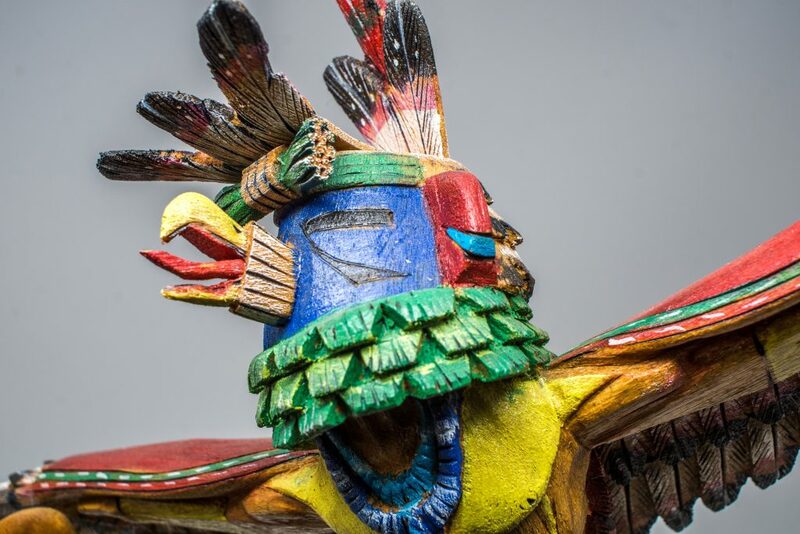 The Katsina have and will continue to be spiritual beings represented by the dancers and, by extension, expertly carved dolls. Tourism plays a part in how many dolls are created and what they look like upon completion. Early tourists to the Hopi Reservation offered to purchase the unique dolls they saw for their private collections. They misheard the pronunciation of the word ‘Katsina’, calling them ‘Kachina’ dolls. There is no “ch” sound in the Hopi language; therefore, the preferred and linguistically correct word is Katsina. Tourism has altered the production of Katsinas in various ways. In the 1970’s collectors began asking for more anatomically correct, fancier dolls. While this produced notable carvings, some felt the dolls were losing their spiritual aspect. 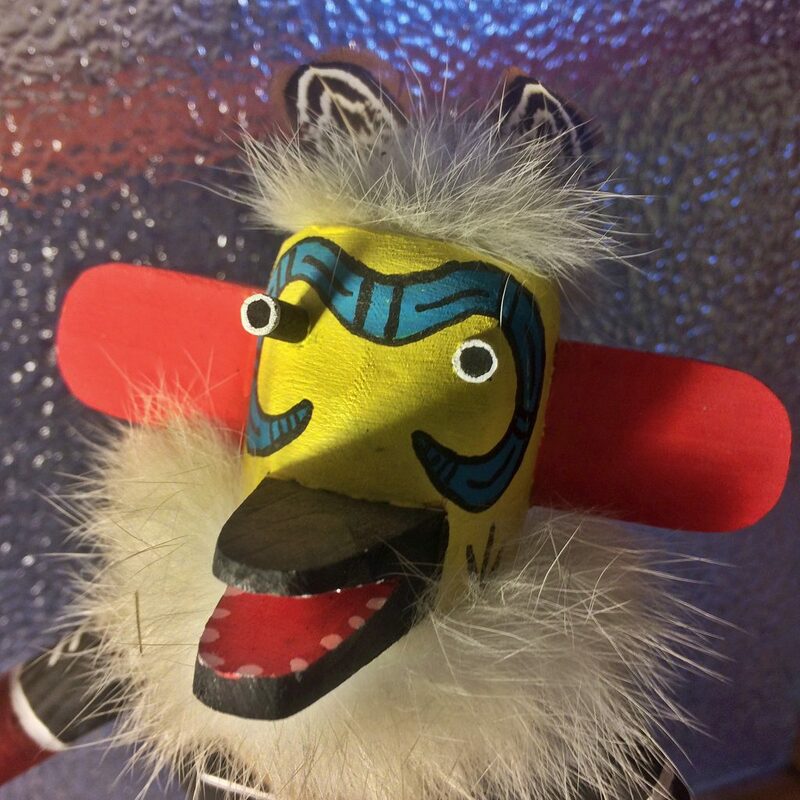 There are many artists who create Katsina dolls; some who produce work the traditional way and others who’ve embraced a more modern doll, utilizing dremel tools and acrylic paints. This can make collecting Katsina dolls a bit of a challenge. If you’re considering a new collecting area, you’ll need to ask yourself a few questions. What type of doll speaks to you? Do ogres, warriors, or certain animals have a personal significance? Are you drawn to the traditional versions, or detailed, contemporary dolls? Is a specific carver desired? Answering these questions will help narrow your search. Most dolls are signed and identify the artist’s clan or village. Fakes by Chinese and Filipino companies do exist, so be on the lookout. There are Navajo artists who produce passable, attractive Katsinas, but as the Katsina are not part of their spiritual beliefs, they are technically inauthentic. Prices will vary with the skill of the carver. It can take from hours to days in creating one of these carvings. As with anything, it pays to do your research before making a purchase. Choosing the right dealer or shop is always helpful when adding to your collections. Visiting the Hopi Reservation can be a learning experience, as is observing the ceremonies when appropriate. The Pickle Barrel Trading Post in Globe has an extensive, curated selection of dolls and books on the subject. Remember, the spiritual Katsina dolls do not exist simply as home decor. They are part of a complicated and nuanced religion which is a way of life for the Hopi people, and has been for hundreds of years. The following books and websites were used as reference in this article. The three books are available at the Pickle Barrel Trading Post.